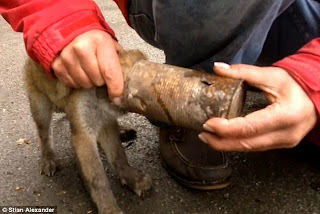 An animal rescuer saved the life of a fox cub that got its head stuck in a discarded tin... and almost plunged 30ft over a cliff in the process. Wildlife Aid Foundation veterinary nurse Lucy Kells rushed from the charity’s base in Leatherhead, Surrey, when a resident spotted the cub in their garden with its head trapped in the empty can. Despite its predicament, the cub was wandering around blindly and Lucy had to chase it into the bushes to catch it, unaware of the 30ft abyss a few inches away.